So you should be warned, that the first 30 or so of these images will be from the Wellesley News between 1918 and 1920. While doing some research on the Wellesley College weekly newspaper, I came across a series of images that I found fascinating and felt the need to do screenshots of them and include them in this Image series. I think many of them are fascinating and curious. Take this image for instance. 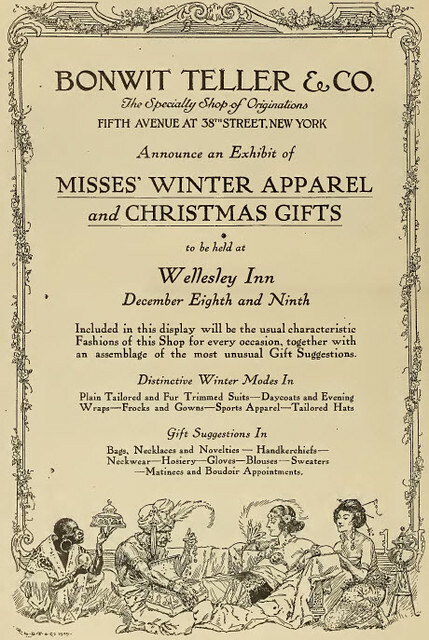 This ad for a clothing exhibit--just in time for Christmas--is not necessarily exciting in and of itself. The newspapers are filled with them, but what's more interesting is the border of the advertisement and the scene at the bottom. In it, we see what are presumably an African, possibly an Arab or Indian, and a woman from Eastern Asia, all catering to the needs of what appears to be a white woman, relaxing in pure luxury. It's curious to see such an image on full display in an advertisement gears towards college women who were largely of middle and upper-class backgrounds. It speaks of the idea of the world at their fingertips and how people of color as there to meet their material needs.